I don’t stay at enough Hilton hotels to reach any of the tiers in their Hilton HHonors program, but as a matter of principle I tend to join any reward program if I can. You never know when it might come in handy. 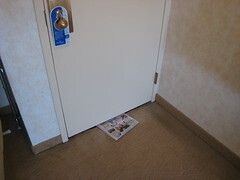 I had always known that most hotels will give you a complimentary weekday newspaper just for staying there, you just snag it from the front desk, but as a HHonors member you can get it delivered outside your door for free. It’s a nice little perk for not that much effort. Another nice perk? Spouse stays free. So no additional charges on the room for the spouse unless there are additional components like meals, parking, etc. It’s always nice to have a newspaper to read if you’re traveling.